NEW YORK (Reuters) - Global equity markets fell on Thursday, pulled lower by declining commodity prices that hurt energy shares, and comments by a Federal Reserve policymaker who hinted that a widely-anticipated interest rate hike next month is possible. Gold fell to its lowest level since early 2010 on concerns about a rate hike by the U.S. central bank, and copper prices tumbled to their weakest in more than six years. Weakness on Wall Street, a drop in commodity prices and poor earnings results dragged shares lower in Europe. The pan-European FTSEurofirst 300 index <.FTEU3> closed down 1.6 percent at 1,470.05 points in its biggest daily decline since Sept. 28. Stocks weakened after U.S. jobs data supported the view that the Fed will raise rates in December. Initial claims for state unemployment benefits were unchanged at a seasonally adjusted 276,000, close to levels last seen in the early 1970s. The MSCI all-country world index <.MIWD00000PUS> lost 0.86 percent, while U.S. stock indexes posted their steepest fall since late September. 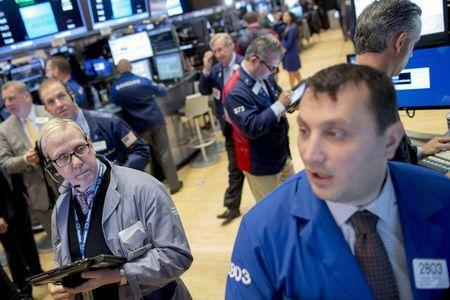 Following October's surge of about 8 percent, stock investors worried about China's economy and a U.S. rate hike are taking money off the table, said Michael Matousek, head trader at U.S. Global Investors Inc in San Antonio, which manages about $1.3 billion. "That's why you have some of this selloff. We're down but it's not like the sky is falling," Matousek said. The Dow Jones industrial average <.DJI> closed down 254.15 points, or 1.44 percent, to 17,448.07. The S&P 500 <.SPX> fell 29.03 points, or 1.4 percent, to 2,045.97 and the Nasdaq Composite <.IXIC> lost 61.94 points, or 1.22 percent, to 5,005.08. Crude prices hit 2-1/2 month lows after the U.S. government reported a stockpile build four times above market expectations and OPEC said its current output could result in a daily surplus of more than 500,000 barrels by next year. U.S. crude fell $1.18 to settle at $41.75 a barrel, and Brent crude slipped $1.75 to settle at $44.06 a barrel. The dollar had rallied earlier against the euro on remarks by ECB head Mario Draghi, who warned that price inflation, a key measure of economic health, was lagging. But the currency markets shifted after St. Louis Fed President James Bullard, generally a more hawkish member of the U.S. central bank, suggested industrial nations may be headed into an era of permanently low rates. New York Fed President William Dudley later said "it is quite possible that the conditions the Committee has established to begin to normalize monetary policy could soon be satisfied." The dollar dropped for a second day as investors booked profits from its recent heady rise, sending other major currencies higher. The dollar fell against the euro, yen and Swiss franc, but analysts remained bullish on its longer-term outlook. The dollar index <.DXY>, which tracks the greenback against a basket of six major currencies, fell 0.49 percent to 98.528. The euro rose 0.57 percent to 1.0804, while the yen fell 0.19 percent to 122.59. U.S. Treasuries prices slipped as selling linked to more corporate supply and $16 billion of 30-year bonds was mitigated by some safe-haven demand spurred by a sharp decline on Wall Street. The benchmark 10-year Treasuries note fell 1/32 in price to yield 2.3169 percent.